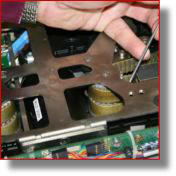 One of the difficulties of having specialist equipment is needing specialist expertise to service or repair it. So we've got a brilliant yet ever-so-simple solution. Apart from its planned annual service in our workshops (when we dismantle your powerchair completely and service all its inner workings), you don't need special skills to look after it or to work on a lot of the parts of a Dragon or SnapDragon. In fact, if you are able to look after a bicycle then you have all the skills you need and if you're not able to do it yourself we'll help find someone local to you who can. 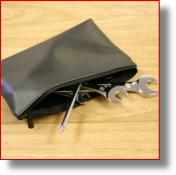 The tool-kit we provide (containing spanners and allen keys) will get you doing most of the everyday things you'll need to do and, if you lose the tools we give you, you can pick up more in any toolshop. If it turns out to be more complex then it still only takes someone who is handy with a spanner to detach the part we identify as needing attention and to attach a new one. We don't leave you to work it out alone we're on the end of the phone every step of the way. As long as you do things with our permission and following our instructions you won't affect your warranty. In this way, we are often able to help you get up and running within a matter of hours instead of having to wait for an expert engineer to reach you. The expert is you.